Around 1 am local time Wednesday morning, June 14, a kitchen fire began in a London high-rise public housing building. It was reported promptly to 999, London emergency services. The Grenfell Tower structure in west London–built mainly with precast concrete, steel and glass–should easily have resisted a kitchen fire long enough for the London Fire Brigade to arrive and extinguish it, but instead the fire spread. Fire escaped through a window on a lower floor of the building, ignited newly installed, flammable materials on the exterior and quickly spread upwards. By the time the London Fire Brigade arrived, only a few minutes after the emergency call, the fire had already climbed well up the building of 24 floors, and it was also spreading sideways. Desperate efforts: The London Fire Brigade was able to extinguish the kitchen fire, but its efforts against the massive fire on the outside of the high-rise building proved futile. 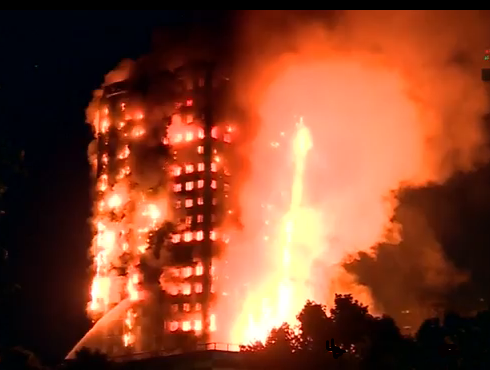 By the time water flowed from aerial pumpers, the fire had spread onto two or more sides of Grenfell Tower and had reached the upper floors. As shown in photos, water streams rose only about halfway up one side of the building and a third of the way up a second. Apparently the London Fire Brigade could not access other sides when it mattered most. The intense fire warped or melted new, thin aluminum window frames, and window panes fell out, allowing the fire inside. The building never had sprinklers. Contents of nearly all dwellings above the eighth floor and some below eventually ignited, further spreading fire from window to window. Interior fires became mostly air-limited and very smoky. Photos show interior fires burning at least 12 hours, until there were no more dwelling contents left to burn. Inside Grenfell Tower, survivors say chaos reigned. In some areas, fire alarms did not sound or could not be heard. Emergency lighting was dim. Residents had been warned to stay inside dwellings in case of fire, but many ran through smoky corridors and down the single, narrow stairway, colliding with firefighters rushing upward. Most Grenfell Tower residents survived, but many who followed instructions became trapped. While the lowest floors of Grenfell Tower suffered water damage, photos show at least three-quarters of the building incinerated. Five days after the fire began, London police stated that at least 79 people had perished. News reports speculated that final numbers could be much higher. Parts of the structure had been found unstable, so that dogs had been sent in to search for remains. Causes of the catastrophe: The Grenfell Tower fire of 2017 did not compare to property damage from the Great London Fire of 1666, but the death toll may have been higher. The British prime minister has ordered a public inquiry directed by a judge. While that is likely to take at least months, contributing factors are already known. It was clear from the outset that materials installed in a recent renovation of Grenfell Tower spread fire outside the building. High-rise structures were traditionally built with fireproof materials: typically concrete, steel, brick and glass. The renovation clad the building in a thick layer of insulation and a thin layer of rainshield. Both the added layers contained flammable materials, and both apparently burned. Early news reports mentioned several different materials used in renovating Grenfell Tower, including highly flammable polystyrene and polyurethane. Discovery of specifications narrowed the list to Celotex RS5000 insulation, 6 inches thick, and Reynobond PE rainshield, 1/8 inch thick–both manufactured in Europe. The Celotex product is rigid polyisocyanurate foam, fire resistant but not fireproof. The Reynobond PE product has a solid polyethylene core, easily melted and readily flammable. For a short time, Philip Hammond, the famously arrogant Chancellor of the Exchequer since July, 2016, muddied waters with a claim that Grenfell Tower renovation materials were banned under British building codes. If so, that might shift liability away from the UK government and toward renovation contractors. Writing in the New York Times, reporter David D. Kirkpatrick soon showed Hammond misinformed or lying. In recent years, flammable materials have been allowed on the exteriors of high-rise buildings in several places, including France, Britain, Dubai, Singapore, South Korea and Victoria, Australia. That has resulted in a series of so-called “cladding fires” on the outsides of high-rise buildings. Until the Grenfell Tower catastrophe, the most widely publicized of those fires occurred in Dubai. The worst of at least five recent high-rise cladding fires in Dubai heavily damaged the Address hotel on New Year’s Eve, 2015, the Sulafa tower on July 20, 2016, and the ironically named Torch Tower on April 2, 2017. The disasters resulted in several injuries but no deaths. In response, Dubai reportedly tightened building requirements, with some previously installed building materials needing to be replaced. Avoiding another catastrophe: A cladding fire in Melbourne, Australia on November 25, 2014, showed how multiple fire-safety measures can avoid catastrophes. Lacrosse Docklands is a 23-story apartment building similar to Grenfell Tower. The exterior had been clad with similar flammable materials. A cigarette left in a plastic dish on a balcony ignited the dish and the wood table under it, starting a fire. The burning wood table ignited an adjacent area of rainshield material, starting the cladding fire. The rainshield on this building was known by the trade name Alucobest. Like the Reynobond PE product, the standard Alucobest product has a readily flammable solid polyethylene core. As with the Grenfell Tower fire, the Lacrosse Docklands fire warped and melted aluminum window frames, and window panes fell out, allowing the fire to enter dwellings. That is where similarities end and differences begin. Unlike Grenfell Tower, the insulation behind the rainshield at Lacrosse Docklands in Melbourne was non-combustible, not merely fire resistant: glass wool instead of polyisocyanurate foam. That probably slowed the speed of fire spreading, and it fed less fuel to the fire. The design of Lacrosse Docklands features bays of dwellings separated by protruding fins. The fire in Melbourne rose rapidly up one bay but did not jump to adjacent bays. Unlike Grenfell Tower in London, Lacrosse Docklands in Melbourne had sprinklers–likely the most important difference. They worked as intended and kept fire from spreading inside dwellings, even though fire had been able to enter through damaged and open windows. The intensity of the fire did not increase through igniting dwelling contents, and fire did not spread inside the Melbourne building. Unlike the London Fire Brigade performance, water flows from aerial pumpers in Melbourne reached to the top of the Lacrosse Docklands building and extinguished the cladding fire. There was substantial property damage in Melbourne, but there were no deaths or major injuries. Multiple safety measures combined to prevent a disaster from becoming a catastrophe. This entry was posted in Development, Events, History, Public health, Regulations, Services on June 21, 2017 by Craig Bolon.